Our 8mm Tuscano style has black carbon fiber in the middle with both sides brushed on the sides. It then has highly polished rounded edges to pull the entire style together. Very wearable from casual Sunday afternoons to your most important wedding day! Was this answer helpful? 22 of 26 Customer(s) found this Answer helpful. Q: What is the width of this ring? 6mm? A: This ring is a 8mm width. Thank You, TF! Q: IS THE ENGRAVING ON THE INSIDE OF THE RING? These rings are far beyond the quality I was expecting given the prices advertised. I saw almost the exact same ring I purchased in a jewelry store for almost $300 dollars. The feel of it, almost identical. The only thing I would mention is that, due to the design of the ring, they do fit a little tight. My partner is a size 10, but we exchanged the ring for a 10.5. I recommend a half size larger than you would normally get. I am 100% happy with my purchase and would totally recommend. Ordered size larger than needed and sent back for the new size. Did not have to contact customer service, as they send the needed return paperwork with the original order. sent "big" ring back and received new ring in 8 days. Could not be happier with the quality,price or speed of shipping. Would recommend to all family and friends. 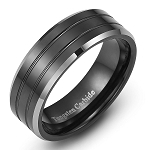 thank you tungstenfashions.com. The carbon fiber inlay looks three-dimensional, like it's coming alive. When you run your finger over the ring surface it's smooth, you feel no joints, it's smoooth. The picture does not do this ring justice. Not completely like picture, but a very nice ring, and the price is right. Excellent service. Easy to use site, incredible tracking and up to date info on shipment. Very very satisfied with product. it's the real deal! Nice ring. Carbon Fiber has a 3-D effect. It has nice weight to it. Great customer service. I ordered too small. They exchanged it quickly without any hassle. Recommended!! Very nice quality. Fit just right. Excellent price. Bought two more of a different style and was also pleased. My husband loves his ring. Very high quality and great price. I am so happy with this ring! It is even more beautiful than in the picture...you can really see the detail of the Carbon Fiber, and it fits perfectly. I was very proud to give this as a gift to my husband. The ring is amazing! Better than I hoped for. Promptly delivered and very well packaged. I will definitely order again. Thank you. 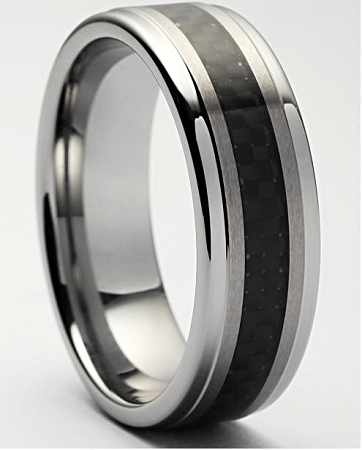 Fantastic ring that shows style and elegance with carbon fiber center that looks 3D and very deep. Shipping was immediate and arrived in just a few days. Fits like a glove and I have worn it every day since it arrived. I would highly recommend this company and its products. The ring is perfect! It looks better in person than online. Is comfortable and I have received a lot of compliments on it! Shipping was next day and came in a nice box. Very happy with this ring! I love it and have been telling everyone about it. First let's say I had My doutes about ordi for my fiancé's wedding band online. But I am so happy I did. The ring is perfect and more importantly it fits him. Size 16 rings are not easily found. Thankfully your site exsists and the quality of your rings are as good if not better than what we saw in all the jewelry stores. The only difference is price. Your pricing is a fraction of the retail fine jewellery stores. I highly recommend shopping with you and I cannot see why anyone would not be elated by this ring. My fiancé didn't want to take it off once I let him try it on. I guess he will be wearing it everyday once we are married! 5 STAR all the way!!!!!!!!! after a couple wrong sizes , ... i finally got the exact correct size .. ! very comfortable , good looking ring .. ! 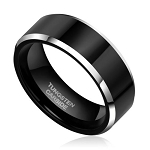 I wanted something I didn't have to worry about scratching , then polishing ... Tungsten is it ! thanks for the help getting the right size to me . ! Pleasantly surprised at the quality and custumer service. I bought two rings, one for my wife and one for me. We both returned the rings for a smaller size. They were exchanged with no hassel. I bought the Tuscano for myself and it looks great. It also looks like it will endure the abuse that my job dishes out. Had many compliments to-date, thanks again.